With rainscreen cladding become the more and more popular choice for new build and refurbishment projects, the concept is no longer new. These projects are being clad in copper, aluminium, ACM and now corten rainscreen cladding every single month. But what are the benefits of using rainscreen cladding? Read on to find out more about these benefits. Of course, there are a lot of important benefits: protection from the elements such as rain, aesthetics, easy maintenance, thermal efficiencies and cost savings as opposed to traditional methods. However, there are also some rather unexpected benefits, too. With the increased demand for larger living space in highly urbanised areas, such as London, Manchester and Leeds, means more and more buildings are being built in noisy sites such as railway networks, busy junctions and airports. This kind of noise pollution can be reduced with rainscreen systems. For example, ACM in particular helps to significantly reduce airborne sound transmission and therefore means less noise for inhabitants in noisy areas. Additionally, with the power of rainscreen cladding as a refurbishment option, there is less disruption created during an over cladding project than when demolishing to rebuild. Climate change means that the Earth is undoubtedly getting warmer, and as reported by the Intergovernmental Panel on Climate Change (IPCC), it is more than 90% likely that the accelerated warming of the past 50-60 years is due to human contributions. This causes significant changes in the timing and length of the seasons and in the amount and frequency of precipitation. This affects rising sea levels, flooding, droughts and changes in the ecosystem that impact on life on earth. One factor in climate change is CO2 gasses, or also known as greenhouse gasses, released into the atmosphere and resulting in more heat being “trapped” in the earth’s atmosphere, causing global temperatures to rise. Aluminium rainscreen cladding can aid in the reduction of these gasses for a variety of reasons. Most aluminium is initially smelted using hydroelectric power, a renewable energy source that doesn’t produce CO2. Also, it can be recycled at the end of its life meaning it can be used again and again. ACM, an aluminium composite material, can also contribute to this since both the aluminium and polyethylene core can be recycled once separated. Aluminium is 99.9% recyclable and takes only 15% of the energy used in its original manufacture to recycle the product. Rainscreen cladding can play a major role in bringing life, vibrancy, colour and love back to older existing buildings. Through refurbishment you can create a striking, breathtaking visual feature through the clever combination of colour and other elements, such as teaming horizontal and vertical cladding together. In today’s world, the ability to shape and curve rainscreen panels means that architects are able to design a limitless range of effects; easily shaping and curving panels helps to create unique details for capping, copings, bullnoses and facias. 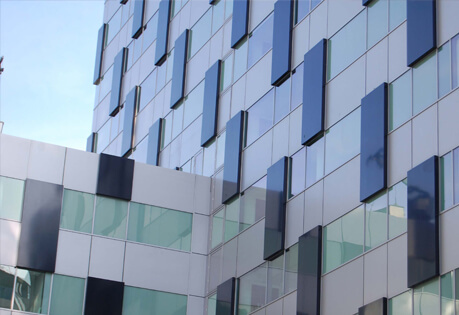 Rainscreen cladding systems of the modern age are lightweight and strong which makes it relatively simple to create engaging and striking designs. Light is integral to residents’ wellbeing, and a room or lobby filled with light has a profound and uplifting effect in contrast to a dark, enclosed space. Rainscreen cladding is a lightweight facade and therefore means a smaller load on the underlying building structure, especially when compared with masonry-based alternatives. Hence, significant savings can be made on foundations and internal supporting walls, but it also means more space can be created in the building for lighter, brighter and more open spaces. With over 25 years’ experience and an enviable reputation nationwide, Metalline have successfully developed into one of the leading fabricators of specialist Architectural Metalwork in the UK. Our latest state of the art manufacturing equipment allows a highly skilled workforce to deliver precision – engineered metalwork on time and to exact specification. This expertise coupled with an ability to react to even the most challenging of design criteria, has led to Metalline’s architectural fabrications being specified by architects and contractors on a wide range of prestigious projects throughout the United Kingdom. We produce architectural fabrications in a wide range of materials for the architectural and building sector. Please take a moment to view our product portfolio and range of successfully completed projects. For more information on how we can help turn your project into something spectacular with our rainscreen cladding services, contact us at 01543 456 930, email us at sales@metalline.co.uk.